Recreate your charm in this exclusive STYLESMYTH T-Shirt. Get great vibes with the current happening multi-colored T-Shirt. 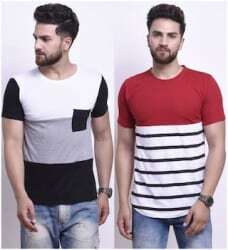 This round neck T-Shirt makes an great snug fit and looks surely great. Wear this half sleeves T-Shirt for a casual outing. Impress your date by turning up in this sharp colorblocked T-Shirt to pick her up. Your fine days need a comfy cotton T-Shirt. Match this T-Shirt with cotton shorts and dress T-Shirts.